You are at:HomeUncategorizedIs this really goodbye?? If you have read this blog for the last few weeks, you will likely know that I have written my own jingles regarding various underappreciated jobs belonging to women all across this land. The jingles are set to the tune of a famous beer commercial. My versions were called “Ms. Salad Bar Stocker Lady” and “Ms. Wal-Mart Greeter and Receipt Highlighter”. In the back of my mind, I suspected that I may have crossed a line when using a title for these series of songs that so closely resembled the “real” commercials. I posted them anyway because, after all, my blog is just a little blip in the big blogging world and who cares what I post anyway? Still…the small voice inside of me told me I may be running the risk of being placed in a guillotine for transforming the lyrics that way. So, I contacted the very, very, very, very, very big beer company to find out. It turns out I was right. I also have to remove the videos I placed alongside my lyrics. Boo. I am now typing this without a head. Dang guillotine. (Bless that typing teacher I had in high school for teaching me to type without looking at the keyboard). I now have to remove all references to the song’s actual title AND the name of the beer on those past posts. I would like to continue posting my version of these commercials once a month, but I have to think of a different name for them and can no longer reference that big, big, big, big, big beer company. If you are not sure what I am talking about because you’ve never read my little rendition, click here to go to sing along with “Ms. Salad Bar Stocker Lady” and click here to go to sing along with “Ms. 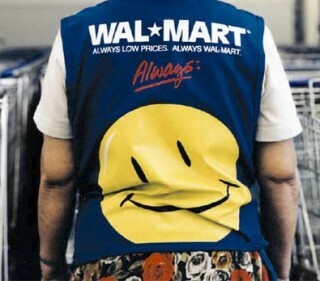 Wal-Mart Greeter & Receipt Highlighter”. These posts are among my most commented, most shared on FB and most tweeted. Although I love coming up with these jingles and they appear to be popular (among my stuff), should I just kick this particular idea to the curb? Should I just tell myself it was fun while it lasted? Will it just not be the same if I can’t call it the title I had before? Surely you can help me. And I will call you Shirley.